What is the purpose of the vast lipid complexity in mammalian cells? What is the lateral organization of membranes, how is it regulated, and how does it influence cell physiology? How does the cell achieve and maintain the dramatic differences in membrane composition between cellular organelles? How is membrane homeostasis maintained in the face of constant challenges from exogenous amphiphiles and dietary lipids? The overall of our laboratory are to understand and manipulate the fundamental molecular mechanisms by which membrane lipids influence cellular physiology. Cellular membranes are a biophysicist’s dream: they are composites of biological macromolecules with a multitude of chemical interactions, which give rise to complex phase behaviors and physical properties. Their study inherently requires a multidisciplinary approach, which is reflected in the thoroughly interdisciplinary, collaborative constitution of my lab: an interactive team of biologists, engineers, and physicists. What are the physical properties and compositions of domains in live cells? How are these domains regulated? How are domains functionalized by the cell? 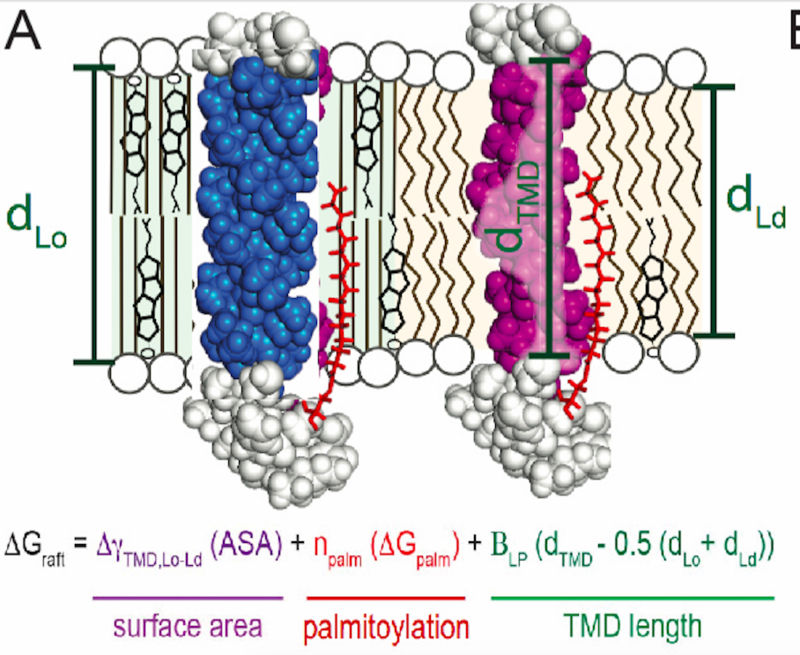 To study lipid rafts in biological membranes, we use an exciting and novel tool in membrane biology, phase separation in Giant Plasma Membrane Vesicles (GPMVs). These plasma membranes, isolated directly from live cells, allow direct, rapid, and quantitative analysis of component partitioning to raft phases in eukaryotic cell membranes. Additionally, independent quantification of protein enzymatic/binding activity permits analysis of the raft-dependence of these characteristics. Using our unique platform for plasma membrane isolation and detailed lipidomic characterization, we have discovered that mammalian membranes are remarkably complex, plastic, and diverse. We have investigated this diversity across a variety of contexts, including neuronal development, mesenchymal stem cell differentiation, and dietary fatty acid feeding. Ongoing project #5: How do cell-specific membrane environments affect membrane protein (GPCR, Akt, TRKs) signaling?